Today (6th June 2018) I received an update to the Ethnicity Estimates created from my DNA at Ancestry.com. This is part of an updates to ethnicities that Ancestry.com are gradually rolling out. I thought it was worth reviewing the updates to see what value, if any, they add to my genealogical research. As a background, I should mention that previous Ancestry estimates for British folks, like myself, tend to include both Scandinavian and Western Europe ethnicities. It’s not hard to understand this problem, given our shared history with our mainland European neighbours. However this does sometimes create a perception problem “Do I have Viking ancestors ?” . The answer, for anyone with British ancestry is a resounding yes. You do have “Viking” ancestors, but everyone with a few hundred years of British heritage will have “Viking” ancestry. Ancestry themselves addressed in this blog post from 2015 “The Viking in the Room“. I was hoping that these Scandinavian and European ethnicities might get addressed (removed or reduced) in this update. I’ve written about my own known regional British heritage in previous posts, however it’s probably easier to give a simple summary of my ancestors. Based on my traditional paper-trail research, I believe I’m 50% North Yorkshire, 25% East Anglia, 12.5% Scots-Irish (but probably lowland Scots) and 12.5% Durham/Scottish Borders. For more visual folk (or aren’t too familiar with the British geography, I have a nice map. The black- pins are my great grandparents. With advancements in DNA science and more data, we’re able to divide the world into more regions. With more regions to work with, we can typically make a more nuanced estimate. We determine your ethnicity estimate by comparing your DNA to samples of DNA from people who have a long history in a region. As we get more samples, our picture of what DNA from a region or group “looks like” gets better. We’ve added more than 13,000 new samples to the original 3,000 in our reference database to give us our clearest picture yet for each region. DNA is made up of strings of four different letters: A, C, G, and T. Our old algorithm looked at one letter at a time, and based on where that letter appeared in your DNA, it decided where that bit of DNA came from. Without getting too technical, our new algorithm reads longer stretches of your DNA at once, making it easier to identify regions of the world where you ancestor once roamed. In addition to this, if you dive into the FAQ you can see how many non-European regions have been more specifically defined. The section below is taken from that FAQ (as at 22-Nov 2018). In addition, our Africa Southeastern Bantu has been combined with our Cameroon & Congo region to become Cameroon, Congo & Southern Bantu Peoples. I think this is an improvement. If it is typical for all testers with British heritage then it’s good to see the disappearance of the trace regions. The flip side is that the more precise Scandinavian ancestry doesn’t seem to add much. The majority of my ancestors come from parts of England that was once under the Danelaw, but that’s over a thousand years ago. The other improvement I see is that Scottish ethnicity has been grouped with Irish, which seems to make sense given my rather basic knowledge of the history of both peoples. It also neatly fudges put my Ulster Plantation ancestors, who were probably Scots. Speaking of fudges, Ancestry has (if I remember correctly) re-drawn the maps of the regions, as you can see this allows quite a lot of overlap in the regions, although I do feel a little sorry for those folks with Orcadian and northern Scottish Highlands ancestry, who seem to not be put in any region. By the Way – I should add at this point that the map is “zoomable” so don’t worry if you can’t see your country’s name up in lights. If you zoom in then even the smallest country gets a name-check. It’s always nice to see the improvement in Ethnicity Estimates, even though the science is still very much a work-in-progress. The flip-side is that I’m not really the target audience for such products. Those targets are based in North America where the combination of high disposable incomes, incomplete record-keeping and diverse ancestries provides a flourishing market for ethnicity products that may reveal unknown “heritage”. For me, DNA is an important tool in my genealogical research, but that is through the cousin-matching algorithms that help validate my paper-based research. The ethnicities, unless something sticks out like a sore thumb, don’t tell me much. I’ll leave me Viking drinking horn in the corner for later ! This entry was posted in ancestry.com, ancestry.com, Genetic Genealogy and tagged Ancestry, ancestry.com, Ethnicity, Ethnicity Estimates. Bookmark the permalink. Thanks for visiting the site. As you say, being Irish I could understand that you should eventually get more Norwegian Norse ancestry. I must admit I’m surprised that you only got 2% British – I assumed that British/Irish are hard to separate due to there relative genetic similarity. (I’m assuming your family origins are from Ireland) Anyway if you have time once your updated results are in it would be nice to hear how your results have changed. I originally got 89% Irish which was updated to Irish/Scottish/Welsh. Not surprised as most family surnames are ancient Irish ones. I have also a few Scottish surnames in my family with gallowglass origins. Gallowglasses were apparently viking mercenary warriors who settled in Ireland during the medieval period. I also have family from the annagassan area where there was a Viking settlement and some Scottish plantation ancestors from the north Antrim coast. It’ll be interesting to see the update but it may take some time. 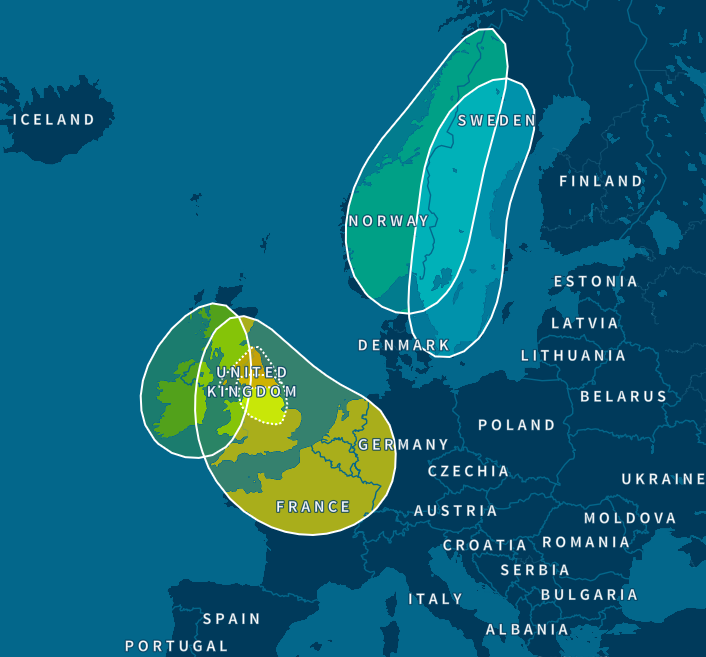 Hi, I received the update and am now 100% Irish and Scottish. 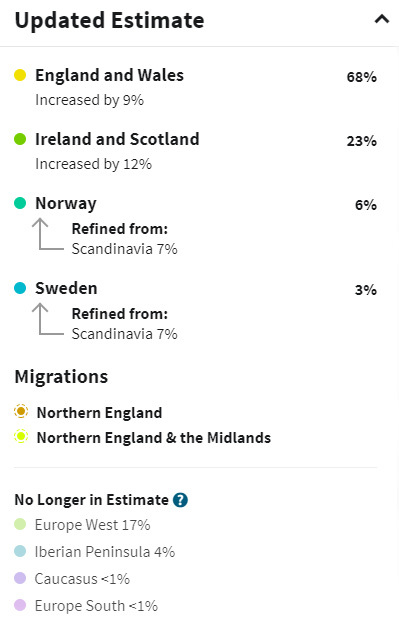 The 7% Scandinavian that I did have, along with the small amounts of Anglo Saxon, Iberian peninsula and central asian have completely dropped off. I always suspected that I was a pure celt but I’m surprised that the Scandinavian has dropped off completely. They say the update is more accurate now but I’m not sure how those regions worked their way into my estimate to begin with but are now no longer relevant.. Thanks for taking the time to come back and report on your updated ethnicity estimates. Good to see that your “false” trace regions disappeared. I hope you are enjoying your 100% celtic status ! Thanks for commenting, and my apologies for the late reply. It sounds like your ethnicity update produced very similar results to mine. For both you and I the updates don’t really add too much, but we weren’t really the target. For people with non-European heritage the regions got separated into smaller areas which can only be a good thing.